The report provides inventory information on tapes exported from tape libraries connected to Veeam Backup & Replication servers. The Summary Information section shows the total number of exported tapes. 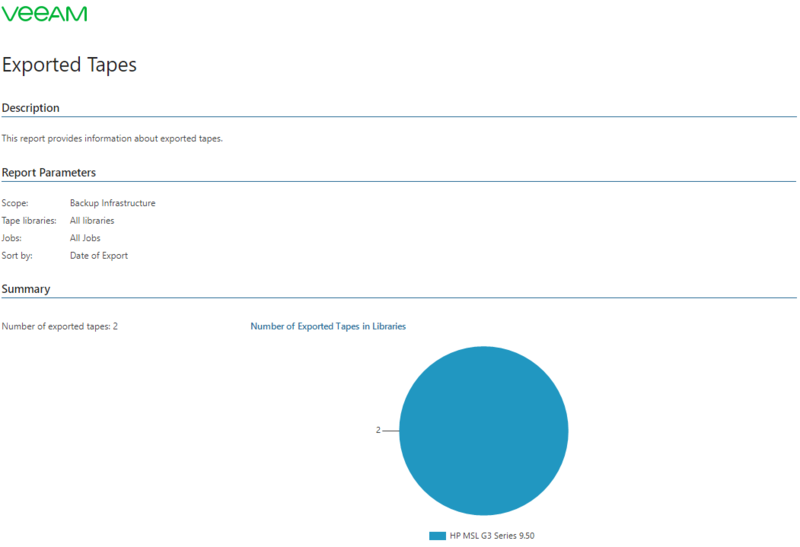 The pie chart displays how many tapes were exported from connected libraries. The Details section contains a table for each tape library with a list of all exported tapes, their IDs, media sets and media pools, backup job and exportation time. The report allows you to trace tapes exported from tape libraries. You can use this report to find the necessary backup files on tape. Scope: defines a list of Veeam Backup & Replication servers to include in the report. Library: defines tape libraries to include in the report. Tape Job: defines a list of tape jobs to analyze in the report. Sort by: defines how data will be sorted in the report (Exportation date or Job name).